Hi ya. Let’s get to it. 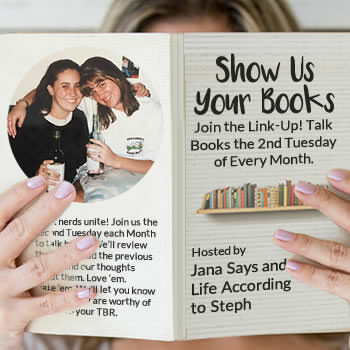 Linking up with Jana and Steph per usual! Uhhhhh… I just don’t know. The Westing Game. I wanted it to be a little more sinister than it was… I guess I should’ve read it when I was younger. I didn’t really enjoy A Wrinkle in Time, either. Once again, I should’ve read it when I was younger. I think I pushed Heartless and The Bear & the Nightingale on people. Whether or not they read them, I don’t know. I finished The Lunar Chronicles this year. Sigh. I wish I could read it all again with virgin eyes. I started reading Agatha Christie books and found out that I really enjoy her writing style. I mean… she’s not new, but she’s new to me. Taylor Jenkins Reid blew me out of the water, too. The Seven Husbands of Evelyn Hugo. I usually avoid contemporary but damn. So good. I give the series overall three stars, but The One was pretty fast paced and “unputdownable.” I also devoured The Seven Husbands of Evelyn Hugo. I bought this book for someone for Christmas and I refused to buy it with the alternative cover. The Bear and the Nightingale. Without contest, The Handmaid’s Tale. Definitely The Handmaid’s Tale again. Intrigue in Capri (54 pages) & Winter (827 pages). There was some serious violence in The Sisters Brothers. Other than all the couples in Winter/The Lunar Chronicles, I didn’t really have a favorite romance this year. Vasya and Alyosha from The Bear and the Nightingale. Favorite Book You Read in 2017 From An Author You’ve Read Previously? I read three from Ashley Weaver this year, but I liked A Most Novel Revenge the best. Best Book You Read In 2017 That You Read Based SOLELY On A Recommendation From Somebody Else/Peer Pressure? I think Jana & Erin both recommended The Sisters Brothers. And everyone recommended The Seven Husbands of Evelyn Hugo. I was so in love with Frost while I was reading The Bear and the Nightingale. It was a weird attraction. Haha. I loved Meyer’s graphic novel debut Wires & Nerve. Best World-Building/Most Vivid Setting You Read This Year? Heartless was amazingly descriptive, as was The Moonspinners. The Art of Racing in the Rain. First of all, the dog’s name was Enzo. Secondly, I started this book right after we lost our family dog Heidi. This book straight up destroyed me- I was sobbing on Sunset Beach in the middle of a hot July afternoon. A Boy Called Christmas. It was a holiday book and a kids book (I think) but it was sweet and sad and wonderful. Last January I made a note in the December section of my planner to read this book and I’m glad I did! One Book You Didn’t Get To In 2017 But Will Be Your Number 1 Priority in 2018? Just one? HA. Probably Three Dark Crowns (Kendare Blake) & Girl Waits With Gun (Amy Stewart) since they’re a part of Erin’s challenge. I also plan to read One of Us is Lying (Karen McManus). Book You Are Most Anticipating For 2018 (non-debut)? I’m hoping to start the A Court of Thrones and Roses series this year. The 2018 Debut You Are Most Anticipating? I’m not sure… Any suggestions? Series Ending/A Sequel You Are Most Anticipating in 2018? I’m pretty excited for Wires & Nerve, Volume 2: Gone Rogue (Marissa Meyer) due out Jan. 30th. One Thing You Hope To Accomplish Or Do In Your Reading/Blogging Life In 2018? I’m planning to finish one of Erin‘s challenges- hopefully the 8.0 one. What did your reading year look like? I really need to get on the Lunar Chronicles myself. I just bought a,Wrinkle In Time to read myself & now I’m afraid. Love how you did this post. My stats aren’t great 😉 I missed my goal by a few books. Oh well. Oh girl… go read The Lunar Chronicles! They’re all out, too, so no waiting around for the next in the series! Glad you enjoyed Evelyn Hugo! I really enjoyed that one. The Lunar Chronicles are the best! It was SO good. I was/am in the middle of two other books but when I opened that from your package I KNEW I needed to start it right away! I’m so glad that I did! I have the most fond memories of reading The Westing Game when I was young. I remember LOVING it. I re-read it as an adult and felt the same way as you…it’s definitely for a younger crowd. After the thrillers and murderous mysteries I’ve read, The Westing Game was clearly written for a younger audience. Lol. I’m ticked I missed out on it in elementary/middle school! This is the second in the linkup I read with these prompts…if I spend too long on them I will not get anything done today! They’re a really good way of making you think about what you read this year. This is such a fun way to look at the books over the year! I wish that I could reread The Lunar Chronicles with virgin eyes too! It was just so good! And I can’t believe that it took me until this year to read The Handmaids Tale too! I’m glad that they made the series because it gave me the push I needed! Very intriguing way to approach this linkup! I like it! Glad to hear continued rave reviews about The Seven Husbands of Evelyn Hugo. I will be reading it soon as a part of Erin’s Challenge. Thanks! I actually filled it out at the start of December, then ended up finishing three more books and I had to redo it. Whoops! I hope you enjoy Evelyn Hugo as much as I did! I definitely recommended The Sisters Brothers because it’s one of my all-time favorite books and the cover IS my all-time favorite. Hooray for Evelyn on another list! Both those books were awesome. I am SO glad I read them this year!! Thank you! Alright, everyone keeps talking about the Evelyn Hugo book, and now i feel like I need to read it even though like you it isn’t my normal pick. And I agree, all the heart eyes for Bear and the Nightingale! You DO need to read it! I don’t know that I’ll read any more TJR because I just don’t read contemporary stuff that often, but Evelyn Hugo knocked it out of the damn park! I’m so excited for the second one to come out next year! And to pick up Renegades! I want to read A Wrinkle In Time this year before the movie comes out. I never read it as a child. I finally read book 2 of the Lunar Chronicles, but don’t think I”m going to continue with the series. I want to read A Court of Thorns and Roses too. I hope you enjoy it more than I did. I listen to the audiobook so maybe reading it is the way to go? Oh man… You’re giving up The Lunar Chronicles after Scarlet?? Honestly, though, if that one didn’t hook ya then it’s probably best you abandon ship now. We both need to pick it up in the new year! i am on the fence about A Wrinkle in Time- i want to read it so i can see the movie and because it’s a classic but i am afraid it will be a ‘should have read it when i was younger’ book for me too. loved the bear and the nightingale, i have the sequel on my kindle hoping to get to it soon. still haven’t read Heartless (I KNOW) but hopefully in 2018.
if someone invents a way to wipe our memories so we can read our favourite books again for the first time, sign me up (but i still want to remember that i loved it and want to re-read it, you know? just forget the details of the book lol). Taylor Jenkins Reid! love her. oh noooooooooo about The Wrath and The Dawn. i loved it 😦 but i get it, pet peeves are pet peeves. i am hoping to get to A Court of Thrones and Roses series as well! sometime in 2018 lol. i am also hoping to finish erin’s 8.0 challenge. i just made my list today, hoping if i left it to the last minute i’d be more inclined to read them. normally i make my list too early and i change my mind in the month before it starts. your stats! the graphs! i love them way too much. so fun. I listened to the audiobooks of Wrinkle. Maybe that had something to do with my displeasure? Man, I loved The Bear and the Nightingale so much. I’m terrified to pick up the next book because what if it ruins the story for me?? I hope you like Heartless when you get around to it. I was in the middle, I guess. I’ve seen a lot of shade thrown its way, though. I love the graphs 🙂 I had to remake them, though, because I finished Evelyn Hugo at the last minute. Ha! Ha! Me too exactly with The Bear & the Nightingale – I have a fictional crush on… Winter? Yep. I am really looking forward to reading the next book in the series. Yeahhh, girl! Like… was he even a person? I don’t know. I was just so mesmerized by him. Hahaha! Do you mind if I make my post look like this next year?? It’s so cute!!! Yeah, girl!! I modeled mine after other people, too! If you think it’ll work for you, use it! Oh, I love The Lunar Chronicles but I still need to read Winter. That will be one of my first 2018 reads I think! I’m glad you are enjoying Agatha Christie! I do love her; my favorite of her books is probably The Murder of Roger Ackroyd. Winter is a long one, but I FLEW through it. I think you’ll love it, too 🙂 If you do (fingers crossed! ), Meyer’s second g.n. in the series is out in February! You won’t have to wait too long!! I need to read The Art of Racing in the Rain this year!! It was so, so good. I sobbed like a baby in a public place (the beach! haha) but I’m so glad I read it. So wonderful. You are right: the cover of that book is amazing! I reread books fairly often, I think, although I didn’t reread many this year. I need to write my 2017 book recap post! The Sisters Brothers was such a good read for me and the cover art caught my eye every time I walked past it. I did and survey for my post too but it’s not the exact same one. I love Agatha Christie! I think I’ve read The Body in the Library about 3 times (enough years apart to forget who dunnit. Haha). LOL, well to be fair I rad it the first time when I was 10 and the second time when I was 18 so I had a few years (and other books!) in between! I love all these prompts! I think The Sisters Brothers has one of the best covers too. I haven’t read the book yet but hopefully will get to it this year. The Bear and The Nightingale is on my TBR but I can’t remember what it is about. 😀 Does that happen to you? Where you have so many books on your TBR and can no longer remember why some are there or what they are about? I am old so it might just be me! Heartless was sadly not a love for me as you know. And to answer your question, I read Alice as a child and did not like it because I wasn’t a fan of fantasy and found it weird. Ironically, if I read it today for the first time, I’d probably like it. But I didn’t so the dislike stayed. I’m next on the waiting list for Renegades and hoping it’s more like Lunar Chronicles. Here’s to more great books in 2018! I am obsessed with the cover. I CONSTANTLY forget what the books on my TBR list are about. I also forget why the heck I added them and who the heck recommended them. Hahaha! No shame there 😉 The Bear and the Nightingale is like an adult Russian fairytale with a badass female protagonist who slowly but surely finds her voice and strength in a very masculine and old-fashioned world. Ahh. I wish I could give you virgin eyes for Alice in Wonderland! Bummer that it’s been tainted for ya! How low on the list are you for Renegades? I was gifted two copies for Xmas so I’ll send one your way if it’d be faster! Man, I LOVED The Bear and the Nightingale! (I forgot that I’d gotten the recommendation from you when I commented on your site earlier this week!) I just love the fierceness and the fairy tale aspect and the subtle romance all wrapped into one unique story. I’ve heard a lot of people rag on Heartless. Hopefully you’ll like it. Wires & Nerve was great, though! If you decided to go in with Evelyn Hugo we can talk about it 🙂 I don’t like *super* heavy stories and this really wasn’t too bad. Maybe I just didn’t connect with the characters as much? It’s just a very intricate tale of old Hollywood.